Henry VI's first parliament, held between 9 November 1422 and 18 December 14222, gave the king's council legal authority to establish mints at York and Bristol and in other places if necessary3. In the indenture of 16 February 1423, Bartholomew Goldbeter (Mint Master of London, Bristol, Calais, and York) agreed to produce 4 ounces of groats, 2 ounces of halfgroats, 3 ounces of pennies, 2 ounces of halfpennies, and one ounce of farthings from each pound weight (12 Tower ounces) of silver at the York mint4. Subsequently a writ of 8 April 1423 ordered Sir William Haryngton (sheriff of Yorkshire from 22 April 1422 to 13 November 14235) to pay for the reconstruction of the king's mint in York Castle. Goldbeter had reported that the mint buildings were in ruinous and unserviceable condition6, having been disused since 13557. Presumably following the requisite repairs, the York mint opened in August 1423. At the Pyx trial of silver coins held on 14 October 1424 to assess the York mint output between 16 October 1423 and 7 August 14248, the largest denomination represented was farthings - 53 farthings or 13¼d, signifying that 36 percent of all silver coins minted at York during this period were farthings. Despite indications from the Pyx trial record, Goldbeter was accused of under-issuing smaller denominations contrary to his indenture. 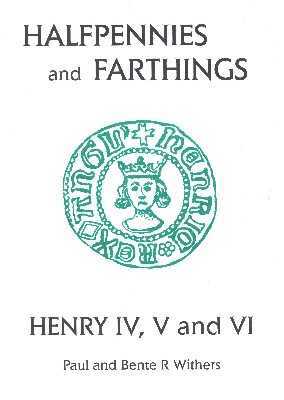 There are only 2 farthing of Henry VI York mint known to still exist, but there is documented evidence that York farthings were minted in quantity. It is only a matter of time before further examples are identified. Lis at neck. Thin neck. Mintmark is a "cross pommee." example of this coin was know. 1 DE JERSEY, P & SCREEN, EM (ed) 'Coin Register' BNJ 78, p. 289. Handbook of British Chronology (London). pp. 568-571.
coinage charges of the coins to be produced. 5 COOPER, T.P. 1911: The History of the Castle of York (London). 1429. pp. 338-9; Ruding, Annals, II, pp. 451-2.